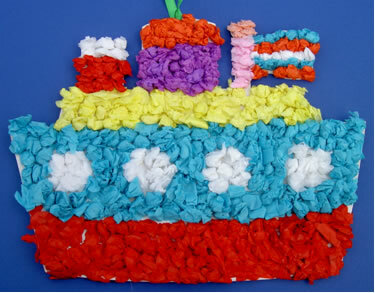 These come in a number of shapes, a ship, car, train, aeroplane, duck, fish, snail, butterfly etc and are so easy to make. Simply peel off the top pre-cut sections one at a time to reveal the sticky surface, scrunch the tissue paper squares and stick them in place. They are quite simple although small children might find them a little fiddly.